Description: This course combines cross country skiing in northern Yellowstone, with a truly unique opportunity for wildlife viewing and ecological interpretation. We will ski tour into at least three remote destinations that are seldom seen by park visitors – especially in winter. Along the way we will study and discuss wildlife such as bison, wolves and other iconic species, and connect them with the greater ecosystem (such as whitebark pine and grizzly bear science). 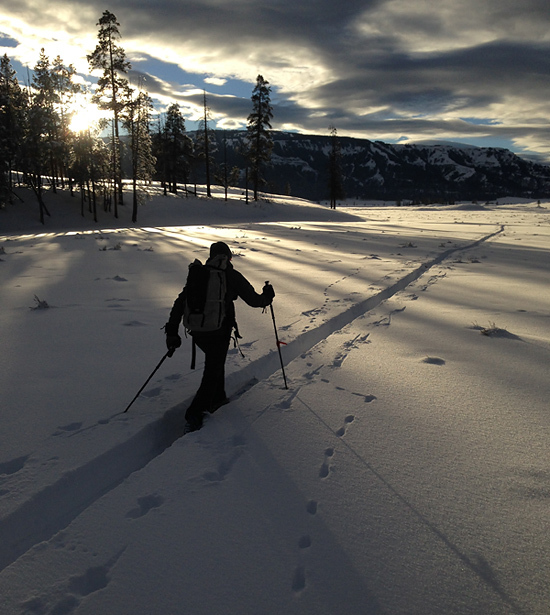 Course leader: Dr. Jesse Logan, renown Greater Yellowstone ecologist and backcountry skier. Cost: $600, , + 3% resort tax. Location: northern Yellowstone Park, with daily trips origionating in Cooke City, Montana. Accommodation included: 3 nights in Cooke City, MT. Additional information: Yellowstone National Park is a UNESCO designated World Heritage Site. This field seminar will utilize cross country skiing as a means to study the incredible ecology and wildlife that has existed since before the earliest European explorers. Winter is the optimal time to experience this wild place. Backcountry travel is fast and relatively easy compared to summer off-trail hiking. We will experience seldom visited places, and do so in a respectful manner, while emphasizing education and natural history. The full complement of large, fierce predators are here; wolves, cougars, wolverine, grizzlies (although they will be asleep until Mid-March), along with all the smaller predators like coyotes, fox, mink and ermine, who are no less important and interesting. All have their unique stories of successfully living in Yellowstone’s sometimes harsh and unforgiving winter environment. Of course, along with all these predators, there is the prey base that supports them – and again, each with their fascinating, unique stories. Through this course, you will have the opportunity for a remarkable cross country ski experience in the presence of this wildlife and learn about how they interact as a functioning and intact wildland ecosystem. We will encounter and track a wide array of wildlife, and just as exciting and interesting, see and interpret the stories of their activity left in snow. We will also discuss changes that have taken place over time, and the interconnections between plants, wildlife and people.